Well, he was not picking up what I was putting, so after awhile, I thought I’d better accept that I was going to be single for the rest of my life. I was about to become ordained and move to my first call in Detroit, MI. I’d seen the statistics about how a woman’s chance of marrying dropped like a rock after they become a pastor. So I said, “Well, God, it’s just going to be me and you in urban ministry, and it’s going to be ok. I’m going to trust that you’ll be with me and give me what I need to follow this call.” I had a sense of peace. About 2 weeks later, guess what happened? Dan called and, as if it was his idea, asked me out on a real date. The rest, as they say, is history. 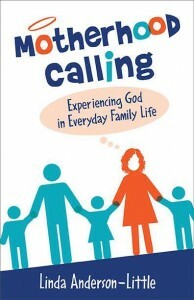 In 2008, I sent my book, Motherhood Calling to several publishers. 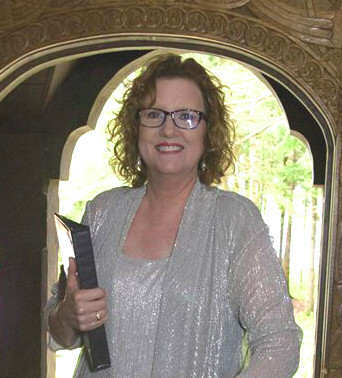 I wanted that sense of accomplishment and recognition, to prove that I was a worthy writer, a good Mom and pastor. All I got were rejection letters, or no response at all. My Mom died in 2012 and one afternoon a couple years ago, I was standing in my kitchen missing her terribly. I got down the cookbook that she put together, which includes family pictures and poems that wrote. I hugged the cookbook to my chest and thought, “I’m so grateful she spent the time putting this together, because cooking from it is so comforting to me now that she’s gone.” It was like scales falling from eyes, when I realized that’s the only reason to try and publish my book, so my kids have these stories when I’m gone. Who cares if anyone else reads or even likes it? Guess what happened? 8 years after my first attempt, my book was published. Are you noticing a pattern here? New life comes once we die to our ego and let go of control, but we resist this process mightily. Our need for control, for programs, projects, plans and preferred outcomes layered with our American flair for rugged individualism makes it hard for us to die to self. Nicodemus, the Pharisee in John chapter 3, is also resisting letting go of his hard-earned status, education and power. As a religious leader, he wants to know if his position, authority, and religious framework is worthy, is right, and of God. Nicodemus comes to Jesus at night under the cover of darkness—as a Pharisee, he can’t be seen asking religious questions—his area of expertise—to an uneducated Galilean peasant, even one who does miracles, like Jesus. The darkness of night in the Gospel of John, however, also symbolizes spiritual misunderstanding or unbelief. Nicodemus’s spiritual confusion is made clear in his conversation with Jesus who speaks of being “born again.” Nicodemus cannot fathom how such a thing is possible. He can think only in concrete physical terms—returning to his mother’s womb—but Jesus is talking about a spiritual re-birth, of letting go and being born from above—born of water and the Spirit. Nicodemus was right about Jesus in verse 3, “Rabbi…no one can do these signs that you do apart from the presence of God.” God’s presence is right in front of Nicodemus in Jesus. Jesus asks him, "how he can be a religious leaders and not understand spiritual re-birth?" But like us, Nicodemus resists letting go and dying to self and to his supposed religious superiority. The question implied at the end of the story is, "Will Nicodemus let go of his ego and allow himself to fall into a trusting relationship with Jesus? Will Nicodemus die to his position, power, and privilege, and affirm that his entire existence is dependent on God?" This is the question that the season of Lent asks all of us. We’re invited into the Paschal mystery that Jesus lived—of dying and rising anew—for this is the pattern of our own life, with each new day, each new difficulty, each new goal and each new pursuit. We resist it because we have to let go before we see what comes next, before we know what being born again will look like. Letting go of ego needs and expectations, agendas and control, always precedes receiving something new; that is the paschal mystery—death always precedes resurrection and God is in all of it. That’s the hard part for us—to trust that God is with us even in death—the small deaths we experience as we grow older, and the big death at the end of our life. Dying to self is the only way we allow ourselves to fall into trusting that our entire existence depends on God, and Jesus will provide everything we need. Whatever we're tightly clinging to, whatever we are resisting—that is where God is nudging us to let go, so we can be spiritually re-born from above, and deepen our trust in Christ Jesus. Indeed, God did not send the Son into the world to condemn the world, but in order that it might be saved through him. When my Mom died, my whole family was gathered around her bed in the ICU to turn off the machines and the medicines keeping her alive. She had been alert just a few hours before. We did the Service of Confession and Forgiveness with her pastor, and sang her favorite hymns. When that last medicine was turned down, my mom died very quickly. It was excruciatingly painful to let her go, but as she was born into eternal life, I was also born again. For suddenly I could see and understand who she really was that I couldn’t grasp while she was alive. Despite illness, mental confusion, pain and physical distress, she held on. She held on and waited for us to be ready to let her go. With a persistent, patient, unfailing love and a strength we didn’t fathom she had, my mom hung on and took care of us in her dying as only a mom can. God’s love in Jesus Christ is like my mom’s—waiting, hanging on, holding out for us to be ready to let go. Jesus waits with a patient, persistent, unfailing love and strength we cannot fathom or imagine, until we let go. While he hung dying on the cross, Jesus waited for Nicodemus to be ready. Down the hill, he saw Nicodemus coming to him, now in the daylight—no longer confused, but as a devoted disciple who trusts him. John 19 says Nicodemus was weighed down with a hundred pounds of myrrh and aloes to join Joseph of Arimathea in anointing and wrapping Jesus body for burial in the tomb. Nicodemus didn’t know that resurrection was coming, but he let go anyway. Nicodemus was born again into a love and trust he couldn’t fathom or imagine. And so are we.